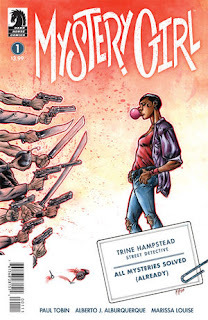 The Fellowship was fortunate enough to obtain a copy of MYSTERY GIRL #1 from Dark Horse Comics. Paul Tobin writes, Alberto Alburquerque draws, Marissa Louise colors, and Marshall Dillon letters. Given her skill set, Trine has chosen an interesting way to make her living – she sits out on the sidewalk solving any and all mysteries that people bring to her. Simply put, she knows the answer to anything they ask. The only mystery she doesn’t know the answer for is her own, how she got her ability. Now a chance has come for her to travel and see things she hasn’t seen before, but it might get her caught up in a mystery she can’t unravel. For someone with such an overwhelming special ability, Trine copes pretty well and she’s really likeable. Not knowing her own story bothers her, but not enough to distract her from helping others. And it’s one heck of a lead into a cool story, so why not? The art works really nicely with how people-centric the story is – the faces are especially well done. Trine is in for a wild ride, and it will be fun to see if her power can get her out of the trouble it just got her into. Go get this one today. 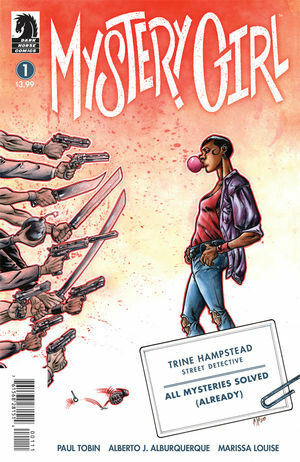 MYSTERY GIRL #1 is available now at your FLCS or at darkhorse.com.